Can love survive the zombie apocalypse? Maybe Dicey's first chance at a real relationship was dead from the start. She's the star of her high school baseball team, and Jack's the star of the science program. Her idea of a study session includes sleeping in the sun, and his idea of a good game involves dungeons and dice. But opposites start attracting when they're assigned to be partners in a class project. Now an outbreak of a weird infection--it eats your brains and leaves you hungry for more--might not mean just the end of their first date. It might mean the end of everything. Will their relationship fall apart faster than zombies in the Florida sun, or can Dicey and Jack beat the odds and find a happy ending? Maria McBride is a little shy and a little awkward. So when she runs smack into--literally--the new guy at school, she doesn't know quite what to do. Tom's kind, good-looking, and well-built. And he's clearly drawn to Maria. But he turns down her tentative invites and seems very reluctant to talk about his past and his family--especially his father, the town's new funeral director. What is Tom's mystery? What's up with his dad's creepy assistant, Graves? What's going on at the family funeral home? And what is Maria getting herself into? 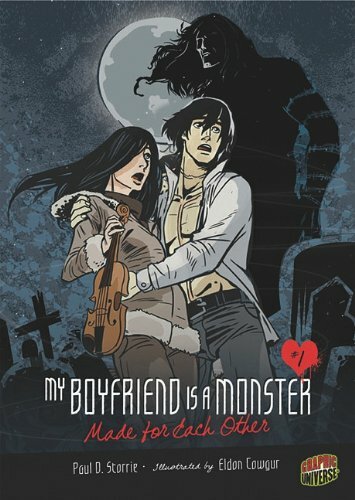 These two graphic novels are the first in a new series (My Boyfriend Is a Monster) that aims to capitalize on the popularity of monsters with teens. The first book involves the zombie menace and the second Frankenstein’s monster. Both cap out at 132 pages, which is short to begin with and even shorter in graphic novel form. Reading both of these probably took a distracted half hour total. The art for the two volumes, though done by different illustrators, was pretty consistent. While not my favorite graphic art style, it was acceptable and matched the stories well. I preferred the Made for Each Other overall, because the story was executed better. The first half of I Love Him to Pieces jumped around in time without warning. I kept thinking that I had somehow skipped a page, because the scene would jump in the middle of a conversation. Perhaps the original version was too long, so pages were removed a bit willy-nilly? Overall, both stories were fairly cute little romances and had humorous moments (like puns – e.g. the titles). I do not plan to continue on with the series myself, but, if you’re bored (impossible to imagine though that may be!) at the library, they will fill a bit of time enjoyably.